This sweet bisque porcelain doll is marked Made in Japan on the back. It is circa 1930s, and it's in great condition for the age. 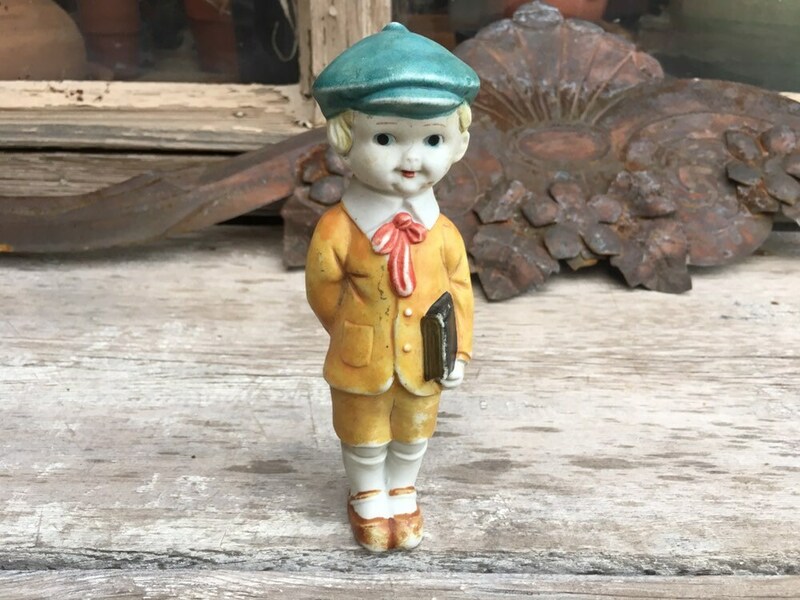 The figureine is of a school boy in tradtional school dress (for the era) plus teal blue cap. The boy holds a book or folkder in his hand. Has the style of "googly eyes" common among Frozen Charlotte dolls or penny dolls, although this particular one was made later and is larger than penny dolls. Measures 7" tall by 2" wide. Weighs five ounces unpacked. Some spots where the bisque is scuffed or stained but in good condition overall. Sweet doll for your collection.